Having climbed the tower I needed tea – and they were serving it outside the Chapter House. You may recognise it … Professor McGonagall’s classroom in Harry Potter and the Chamber of Secrets in 2002. It was too dark to get a decent photo of the whole room. It is not normally open to the public. There are some details on this website. 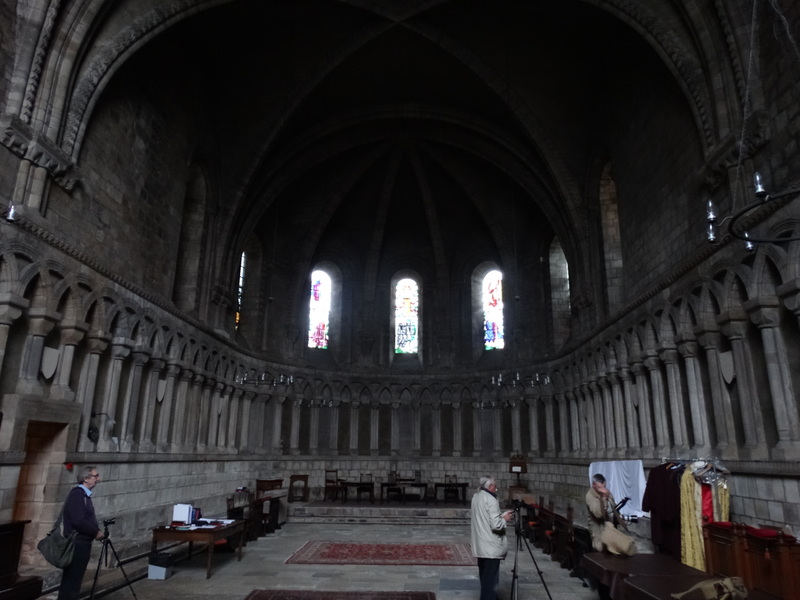 A Chapter House is called a Chapter House because every day the community would gather to read a chapter of the Rule of St Benedict. It was the finest Norman Chapter House in Europe, until it was partially demolished in 1796 to create a warmer environment for clergy. It was rebuilt in the original style in 1895. Some interesting windows – presumably Victorian. Well, that’s what I wrote originally. I have now found a booklet about the windows – so let’s update this blog. The windows are by Hugh Ray Easton (1906-1965), so, no, not Victorian. In the Nave we have his Oswald window (SW corner), Cuthbert (NW corner) and RAF window. 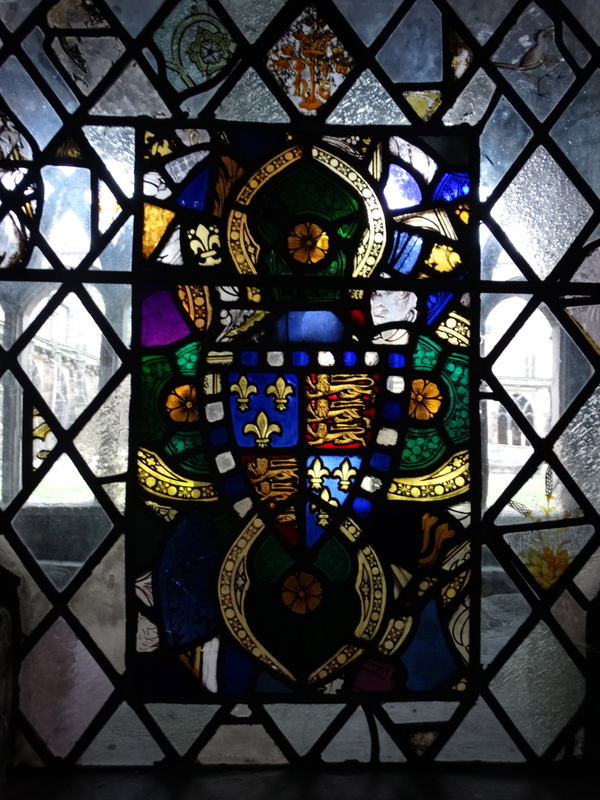 The Blackett Memorial window is in the North Transept. 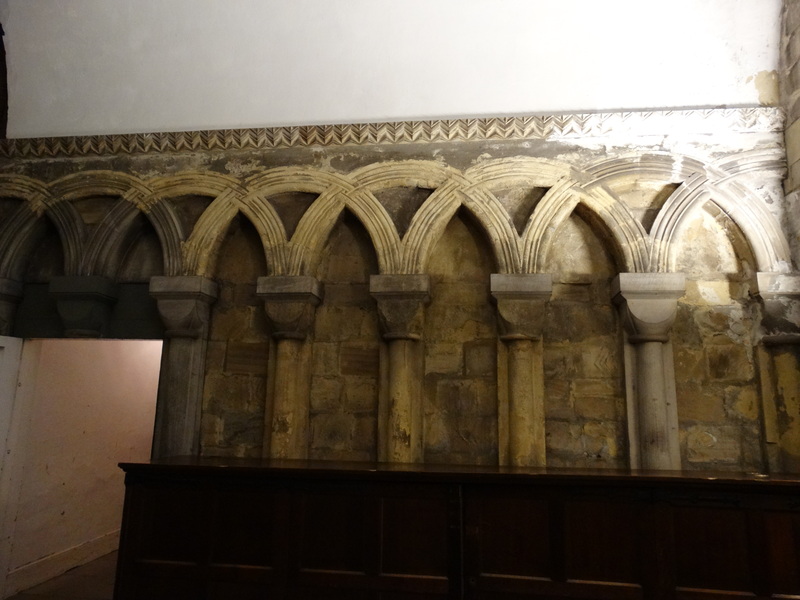 Seven of his windows are in the Chapter House. 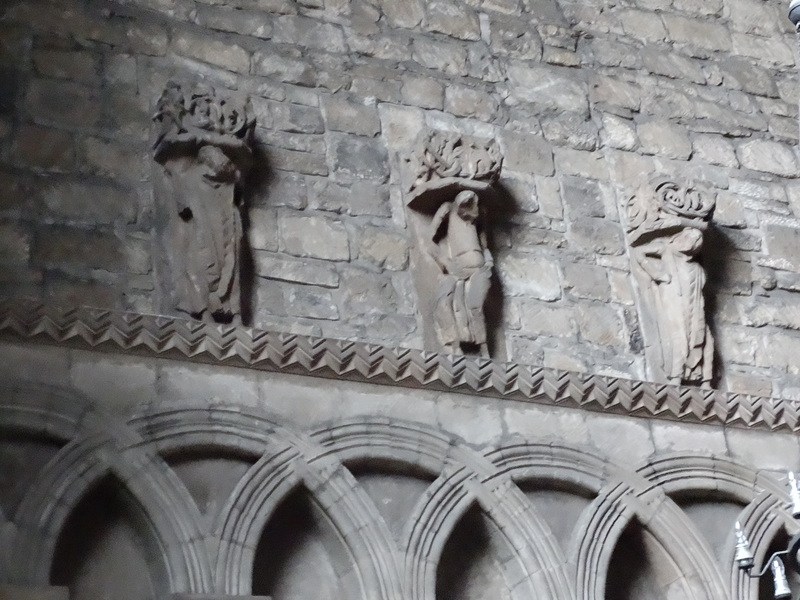 The first (unphotographed) shows Bishop Walcher, the first bishop of Durham (1071-1080) with Adam and Eve. It was dedicated in 1947 and commemorates those Cathedral choristers who gave their lives in WW2. Second (unphotographed) commemorates Arthur Harrison of Harrison the organ builders. Bishop Hugh de Puiset (1153-1195) holds an image of the Galilee Chapel. 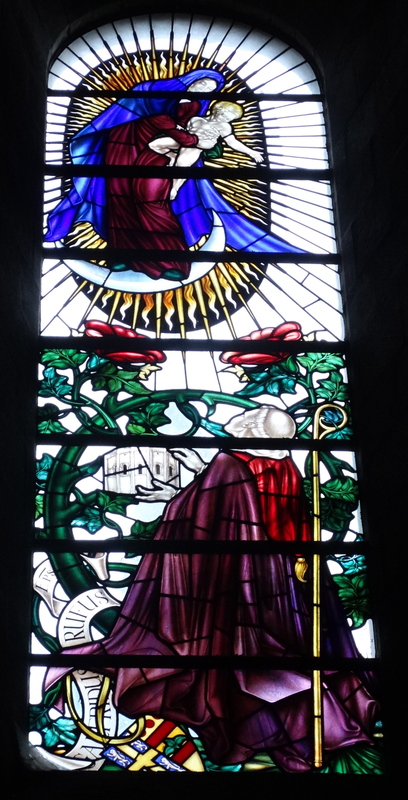 This third window was dedicated on 20 December 1936 and has the Incarnation as its theme. Bishop Rufus (1133-43) is shown in the likeness of Bishop Handley Moule (1901-1920) adoring an image of the Virgin and Child, whilst holding an image of the Chapter House, built while he was bishop. Fourth, in the centre, has the Crucifixion as its theme. St Benedict looks upwards at Christ on the Cross. This was given in commemoration of those choristers who died in WW1. Fifth, dedicated on 29 May 1937, has the Ascension as its theme. Francis Priestman, a founding member of the friends, is commemorated in the likeness of Bishop Flambard. Sixth, Verbum caro factum – the Word made flesh. Bishop William St Barbara (1143-53) is shown in the likeness of Bishop Brooke Westcott (1889-1901). He is having a vision of John writing his Gospel. The last window was dedicated in 1948 and has the heavenly Jerusalem as its theme. It was given by the Free and Accepted Masons. Bishop Alwyn Williams (1939-1952) is show in the likeness of Guliemus de Carileph (Bishop 1081-1096). Although he died in 1096 his plans were completed in 1133, and so he holds an image of the completed church. 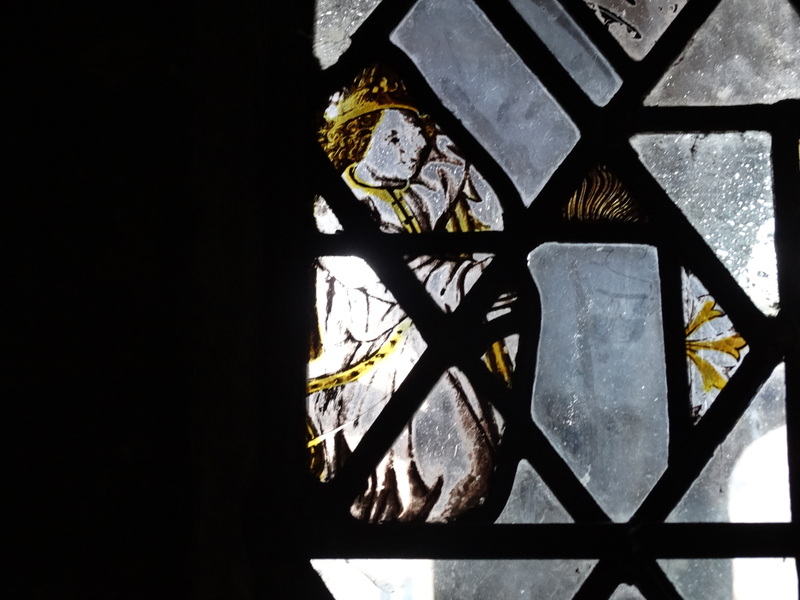 There are also some lovely fragments of medieval glass. Outside – as well as the tea – is some older arcading. This entry was posted in Cathedral, Durham. Bookmark the permalink.